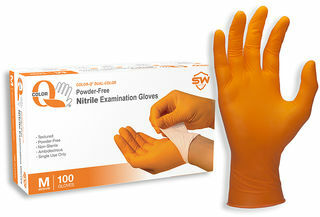 SW Safety Solutions N017753 Quasar® X7 Nitrile Powder-Free Exam Gloves, 100/Box, 10 Box/Case, M | Products | Personal Protective Equipment | Hand & Arm Protection | Disposable Gloves | Exam Gloves | Scientific Sales, Inc.
Quasar X7, Thickness Finger-5.5mil, Palm-5.0mil, Orange, Nitrile, Powder-Free, Exam Gloves. Extended 10.5" cuff for extra protection. 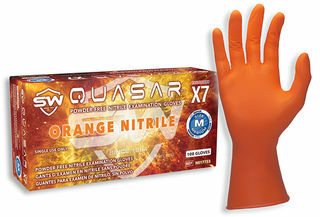 Quasar X7, Thickness Finger-5.5mil, Palm-5.0mil, Orange, Nitrile, Powder-Free, Exam Gloves. Extended 10.5" cuff for extra protection. Non-latex nitrile offers superior abrasion and puncture resistance and the fully textured grip allows better handling of small parts and slippery objects.